. rokujuurokubu 六十六部 Rokujurokubu, Rokubu pilgrims .
. Join the Rokubu Pilgrims on Facebook ! . 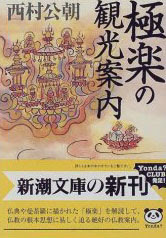 This is a pilgrimage to many places of Japan, and many legends are connected to the pilgrims. 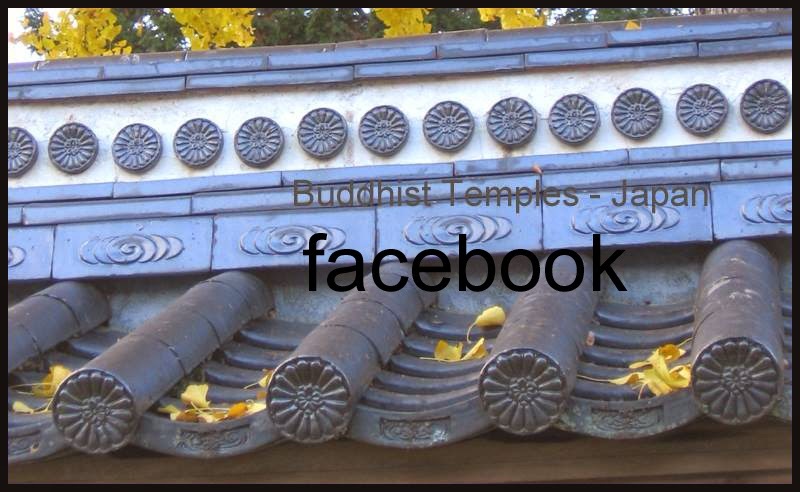 in 66カ国 66 different domains of Japan. Once upon a time a vicious serpent (or maybe a Kappa) lived in the river and many children lost their lives. The villagers asked a Rokubu what to do about this. The Rokubu told them to make mochi 餅 rice cakes on the last day of the year, give them to children and have them throw into the river. This would protect the children. And indeed, from that time on, no more water accidents happened at the river. byooninbatake 病人畑 "field of ill people"
Once a man bought 桑畑 a mulberry field without knowing it was in fact a cursed field. In former times it belonged to a family who killed a Rokubu priest and robbed him of his money. He cursed the place and fire balls were hovering over the home. The dam broke very often, since it had not been repaired properly for a long time. Finally repair work started, but did not go well. The villagers asked a Rokubu what do do. He said they needed a human sacrifice and since he was alone, offered to be buried there. And indeed, the construction went on well and the dam was strong. To show their gratitude they build a memorial stone and a grave for the Rokubu.
. hitobashira 人柱 "human pillar" - human sacrifice .
. Jizoo 地蔵 Jizo and Rokubu . In the hamlet of 京津畑 Kyotsuhata there was a family who had killed a Rokubu to get his money. But he cursed them and they had bad fortune ever since, even their children were cursed.
. zashiki warashi 座敷わらし /ザシキワラシ child spook . It was seen in 1952! It is a bad one, sitting on sleeping people and prevents them from sleeping. They say it must be an incarnation of a Rokubu who had been killed for his money. 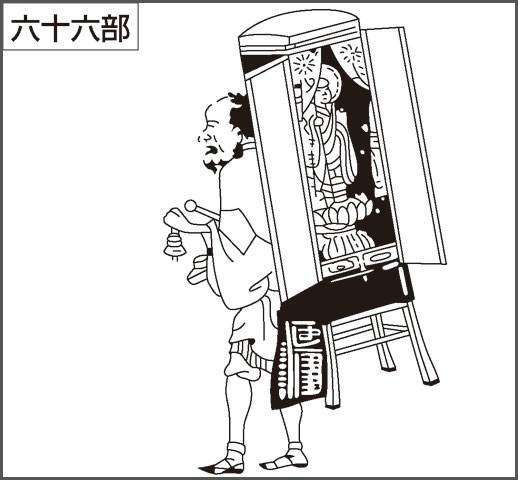 In the house of a family where a Rokubu had stayed over night, there was a son who had no eyes, nose or mouth. When they poured some powder from a grinder over his head, the hair begun to move and take in the powder. In another house there was a son who from the waist down looked like a horse. Once upon a time, 孫四郎 Magoshiro from Tono village passed along the 閉伊川の腹帯ノ淵 Haratai no Fuchi riverpool of river Heigawa. Out of the pool came a beautiful young woman. She gave him an envelope and asked him to bring it to the Master of the Pond of Monomiyama 物見山の沼. On the way he met a Rokubu, who exchanged this mysterious letter into another one. WHen Magoshiro delivered it to the Master of the Pond, he got a stone mortar as a thank-you present. When he came home and put some grains of rice in it, they came out as grains of gold! Thus Magoshiro became very rich. But when his wife tried to over-do it, the mortar stopped turning. 脛立 /フッタチ / 経立 Futtachi, "old animal Yokai monster"
In a certain family they had many children born, but they all died soon after birth. The old hen of the family had transformed into a Futtachi. The hen cursed all the people of the family, who had taken her precious eggs and eaten them, preventing her from having children. This was her revenge. A Futtachi is an old grumpy animal turned Yokai. It can be a hen or a monkey, a fish, dog or any other animal. It becomes very huge in size and can easily revenge itself on the people. Futtachi are common Yokai in Aomori and Iwate. They appear in the 遠野物語 Tono Monogatari legends of Iwate. 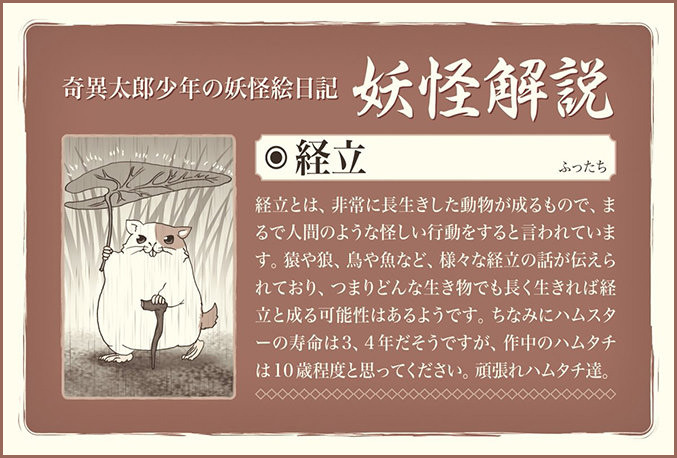 ... "a futsutachi is any animal that becomes a larger, more powerful youkai by living to an advanced age." futtachi - ein altes affen- und hundähnliches Ungeheuer. In 安家村 Akka mura there is a legend about a Fish Futtachi. Once upon a time, there came a beautiful young man to the home visiting the daughter, every night. The neighbours got suspicious and thought this must be a Futtachi. They advised the daughter to wash the feet of the man with water where soy beens had been boiled in. She did as told and suddenly the young man felt unwell and hurried away. The next morning she went to the beach and found a dead tara タラ cod fish. ..... Nue followed the blood drops on the ground until they led to a strange dead creature in a rock cave. He carried the creature back to his home. When his father saw it he said that it was a so-called saru-no-futtachi. a kind of legendary monkey resembling a human being. He likes women and often steals them from villages. He varnishes himself with resin and sand, so that his fur is as hard as iron and a bullet cannot penetrate it. 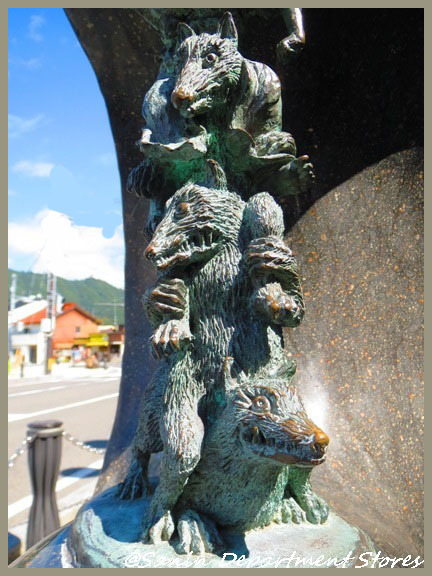 This creature seems to be known only in Iwate-ken.
. Tōno monogatari 遠野物語 Tono Monogatari Legends - Introduction . "When it gets five, it will meet カワドイ kawadoi." (The meaning is not clear, but something about a water or river accident). When she gave birth to a child, she remembered the warning and as the child turned five, she boiled rice with beans, made a 藁人形 Wara Ningyo straw doll for curses and threw them into the river. Thus the child was saved.
. wara ningyoo 藁人形 straw doll for curses . If someone is disrespectful to the Deity of the Land, he will be punished with stomach ace, skin infection or other diseases. At many estates there are sanctuaries for this deity, where they pray for warriors, wolves, and Rokubu who were killed, so as not to be cursed by wrongdoing.
. jigami, jishin, chigami, chijin 地神 Kami of the Earth / the Land .
. Rokubu no motte ita awa 六部の持っていた粟 Rokubu pilgrim carrying foxtail millet .
. Rokubu Jizo no bachi 六部地蔵のバチ divine punishment .
. 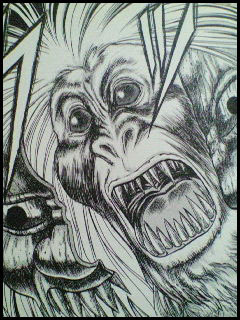 The brave dog 早太郎 Hayataro and the baboon monster . 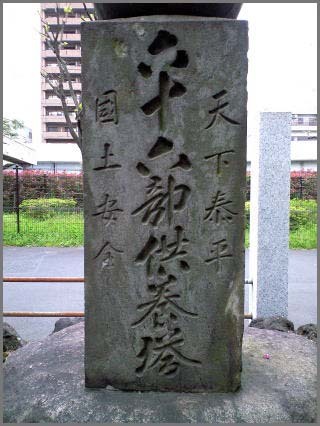 岡部吉左衛門 Okabe Kichizaemon is the great ancestor of the Okabe clan. His wife おつねさん O-Tsune was a Tanuki badger living at the nashi no ki 梨ノ木 Japanese pear tree. When a Rokubu stayed at the estate, he realized this truth and told it to Kichizaemon. Or maybe O-Tsune san was a wolf and came to the home of Kichizaemon, shape-shifting into an old hag. They hit the wolf until it was dead and the figure of an old hag appeared, then turning into a dedd wolf again. Around 1775, a farmer from Takeno had killed a huge serpent which had devastated his buckwheat field. Since than, many small snakes had appeared in his home. To appease the soul of the serpent, the farmer decided to become a Rokubu pilgrim and also built a stone memorial. But until further generations of his family, bad luck continued. The water of the river which was filled with the liquid from the dead serpent, was unsuitable not only for humans, but also for horses and cows. senbiki ookami 千匹狼 / (センヒギオオカミ) / センビキオオカミ "one thousand wolves"
A travelling tradesman (a Rokubu) was attacked by a group of wolves and climbed a high tree. The wolves begun to form a piggyback tower up to the tree, but he was saved by an old hag. Once upon a time a Shinto priest was accompanied home by his okuri ookami 送り狼 escorting wolf, who pulled at his sleeve and showed him up to the mountain, then hid him in a cave　and thus saved his life. Soon after a parade of 1000 wolves passed by.
. ookami 狼 Okami, wolf legends .
. rokujuurokubu 六十六部 Rokujurokubu, Rokujuroku Bu pilgrim .
. Japan - Shrines and Temples - Index .